Hello! I wanted to play along with today's Sketch Challenge on SCS and I was dying to ink up one of my new images~Kraftin' Kimmie Gabrielle. Isn't she ADORABLE!!! 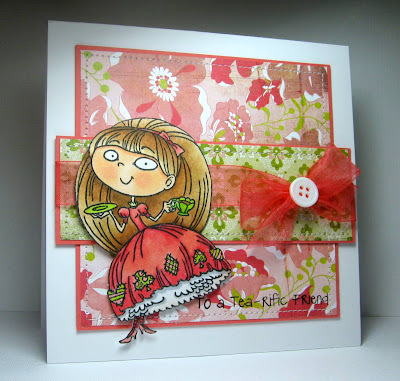 This is also for this week's Kraftin' Kimmie Challenge to use PINK! I used some Basic Grey Olivia dp which has lots of pink :) This is also for the Papertake Weekly Challenge~In the Garden. I have lots of flowers on my dp, and what better thing to do in the garden than have tea? I also used some gorgeous Coral Organza Ribbon on my card from Really Reasonable Ribbon. Thank you so much for stopping by and enjoy the rest of your day! It's raining like crazy here and the lightening~YIKES!!! Hope the power stays on! AWWW Kerri I LOVE this image...she is sooo cute and LOVE how you colored her hair...Beautiful colors Tea-rific is just PERFECT GF!!! Hi Kerri! Your card is tea-riffic! Have a great day and stay dry! Aw!! I love this Kerri!! I need this Gabrielle image! She is gorgeous and your coloring rocks girlfriend!! Awesome take on the sketch! Very cool coloring and I love that layout!! This is just gorgeous!! I love the image and your colors too! Fabulous! And you are oh.so.patient to cut that little Kimmie out so perfectly! Awwwwww! Gabrielle looks stunning! Great colouring! Thanks for joining us for this week's Kraftin' Kimmie challenge!! Look at her big-ol' hairdo with that poofy dress going great with that foofy ribbon! I got my order and will be playing with Olivia and Oliver this weekend - yippee!